The past decade has witnessed an explosion of interest in mindfulness, which refers to “paying attention to what’s happening in the present moment in the mind, body and external environment, with an attitude of curiosity.” It is the subject of bestselling books, popular online resources and widespread media coverage. The idea is that, by teaching a person to be more focused on the present moment (typically through simple meditation exercises), they will become considerably less caught up in thoughts about the past or worries about the future. Practising mindfulness has been found to reduce the incidence of depression, stress and anxiety and it is now widely used by mental health practitioners. But the uptake is far broader than this, with courses on mindfulness increasingly offered in schools, the armed forces and workplaces (including the Bank of England and many commercial banks). Why does this matter for economics? Mindfulness has been the subject of extensive research in the fields of psychology, neuroscience, sociology and philosophy. For economists, a number of angles may be of interest. It has been argued that it directly improves wellbeing. In the workplace, it can boost productivity by raising employees’ cognitive skills (as well as reducing days off due to mental illness). But there are more profound lessons for economics, too. At root, mindfulness can be understood in terms of what I call – for want of a less clichéd expression – a “less is more” approach to the relationship between consumption and happiness. If true, this has pretty fundamental implications. But before exploring this idea further, we first need to review the “more is more” assumptions of neoclassical consumer theory. The term “economic man” was first used in the late nineteenth century, in response to the writings of John Stuart Mill, to mean “a being who desires to possess wealth”. Since then, homo economicus has come to mean an individual that acts rationally to achieve his or her predetermined goals, obtaining the highest possible utility given the information available. Over time, criticisms of homo economicus have come from various angles. Anthropological studies have suggested that human behaviour in some societies differs considerably from this caricature. And studies in behavioural economics have shown how, in reality, people are nicer than the homo economicus model would suggest – they have “other-regarding preferences” – and how this description ignores the limits to the information people have to base their economic decisions on (see Rabin (1998) for a review). At the heart of the “less is more” challenge to consumer theory that I set out here is an understanding of our desires. The key insight of this approach is that we can be happier by seeking to simplify our desires rather than satisfy them; the result is less consumption yet more utility. First, all of our mental states – whether we are happy or discontent, feel secure or insecure, and so on – are transient. That is especially the case when these mental states are most directly a function of external conditions like the behaviours of those around us, say, or the things we consume. Most people tend to agree that when we get something that we desired, it makes us happy – but only for a while. And more often than not, once the novelty has worn off, a new desire presents itself to fill the gap. Second, as we get used to consuming more (or accumulating more wealth), at a psychological level it is incredibly difficult not to feel attached to certain amounts of consumption (or wealth). The “less is more” critique of homo economicus, therefore, implies that desires (or preferences) need not be taken as given. We need to consume some things but many of our desires, the argument goes, prove to be illusory when we consider the transience of the satisfaction they bring or the feelings of attachment they generate. By better understanding our desires, we may find it makes more sense to try to simplify them rather than satisfy them. Pursuing this approach, fewer desires “crystallise” into consumption, yet happiness is higher. How does the rise of mindfulness fit into all of this? While it has its roots in Buddhist thinking – and has been practised for thousands of years in that context – the recent explosion of interest has largely occurred in Western societies. Even so, the recent interest in mindfulness likely contains at least an element of the philosophy set out above. Indeed some papers explicitly characterise mindfulness as observing experience directly, rather than “through the filter of our beliefs, assumptions, expectations and desires”. Others argue that mindfulness may promote reflection on our consumption activity, including how we react to advertisements (see Rosenberg (2004)), such that desires “need not be reacted to in knee-jerk fashion” (Brown, Ryan and Cresswell (2007)). To test this, Brown et al (2007) look at individuals’ “financial desire discrepancies” – the gap between current and desired states. And interestingly, the authors find that individuals who practise mindfulness reported lower desire discrepancies and higher subjective wellbeing. This is just one study and more research is needed. 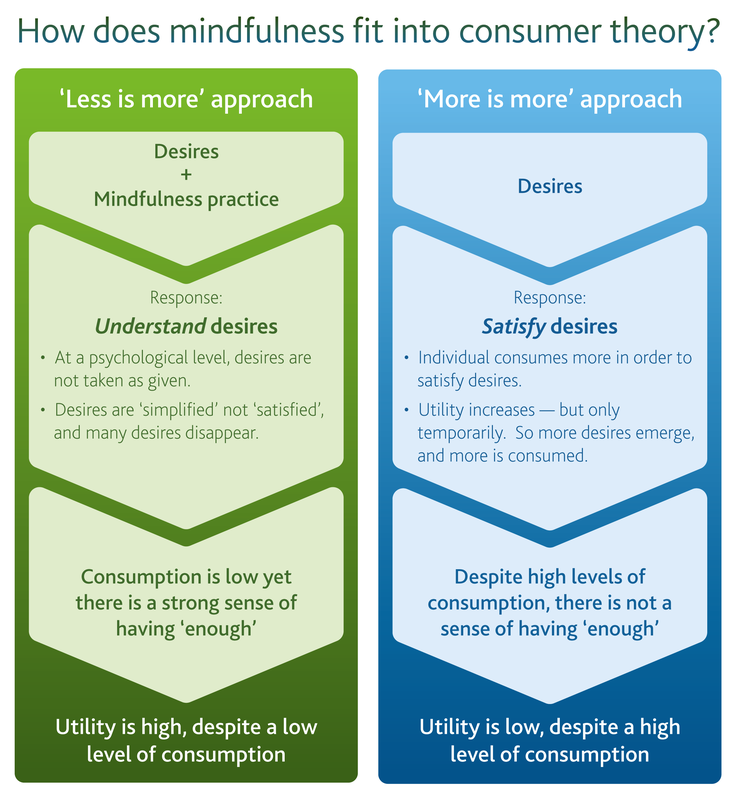 But it does suggest that mindfulness can cultivate a stronger perception of having “enough”, rather than craving for more – precisely in line with the “less is more” reasoning set out above and in the graphic below. What might a more “mindful” economy look like? At a microeconomic level, the “less is more” theory contests the fundamental notion that, beyond a certain level at least, utility increases with consumption. This is pretty profound. Arguably, it goes further than critiques that point out the existence of altruistic behaviours or limitations to individuals’ information sets. And it gives further support to studies that highlight the importance of immaterial determinants of wellbeing. Within macroeconomics, too, there is an extensive literature on happiness and the “less is more” theory is consistent with the empirical claim that happiness does not increase as a country’s income rises. Various organisations have been developing measures of wellbeing that go beyond measures like GDP. Incorporating “less is more” ideas into these frameworks would not be straight-forward; when it comes to measurement, for instance, it would be important to distinguish between workers voluntarily working fewer hours (and consuming less) due to things like mindfulness, say, compared to workers losing their jobs involuntarily for some other reason (which, as Paul Krugman notes, is “almost always a terrible experience”). Even so, it would be worth exploring this further, and any policy implications. The debate on secular stagnation provides extra motivation for looking at new ways to achieve happiness. Economists disagree on the underlying causes of low growth (compare for instance Gordon, Summers and Rachel and Smith) but many agree that the prospect of protracted periods of stagnation looms large as a genuine threat for advanced economies over coming decades. Now, if that’s the world we are in, increased attention will naturally turn to alternative ways to increase wellbeing; “less is more” ideas could form one part of the solution. Finally, there could be interesting implications in the field of environmental economics (see Carney (2015)). Since human wellbeing and ecological sustainability are often assumed to be in conflict, the neat thing about the “less is more” critique is that it achieves less consumption without constraining people’s decisions. Already, there is some empirical support for this idea: Brown and Kasser (2005) find that human wellbeing and ecologically sustainable behaviours in fact go hand in hand, identifying mindfulness as one factor that is significant in driving this relationship. It’s been said that “economics is all about consumption”. The rise of ideas like mindfulness offers a counter to this view. Of course, the “less is more” critique only works to the extent that individuals trying out things like mindfulness do indeed experience the greater sense of having “enough” described here. But insofar as it is possible to achieve better outcomes with lower rates of consumption, the lessons for economics would be far-reaching. Dan Nixon works in the Bank’s Stakeholder Communications & Strategy Division. Previous Post Shocks Happen: Are Retail Deposits the Answer? Happier countries have lower GINI coefficients (Helliwell, J., Layard, R., & Sachs, J. (2016). World Happiness Report 2016, Update (Vol. I). New York: Sustainable Development Solutions Network) so the adoption of mindfulness by those in the income upper decile may have a role to play while the wages share of GDP is manipulated upwards towards its equilibrium. This would dispel secular stagnation by broad demand stimulation. Without such a selective approach to mindfulness, aiming for its universal adoption would be akin to erstwhile uses of religion as the opiate of the masses to further facilitate wealth transfer. Why has it taken until after the end of my career for common sense to be allowed in economics articles. Young economists are lucky to have missed the gauleiters of Chicago and the fantasy strictures of the physics-based economic modelling . Homo Economicus, as referred to, was invented only about 40 years ago. Before then concepts such as ‘satisficing’ were main stream. Thank you for a most interesting article. In the ‘doing’ mode we think of the world as made up of external ‘things’ which are separate from the ‘self’, which is also conceived of as a separate and distinct thing. Our linear conceptual thought patterns rely heavily on language, words, and nouns in particular, to categorise and define reality, and our thinking is constrained by grammar and syntax. Maths is another useful language for ‘thinking about’ reality indirectly. The danger arises when we forget to distinguish between reality, and our thoughts about reality, and we conflate them and end up believing that our thoughts are the same as reality. This process misleads us into thinking that our happiness can be increased by material consumption. ‘Mindfulness’ is practicing the ‘being’ mode. Being in the present moment with full attention, and without judging the content our experience as either ‘good’ or ‘bad’, but simply accepting it and examining it very closely, whatever it is. This direct observation of reality leads to very different conclusions from the traditional indirect dualistic ‘thinking about’ reality, which has driven western thought. A view of reality as a verb emerges, rather than as a set of ‘nouns’. Reality is directly experienced as a constantly changing processes of interconnected phenomena that is compatible with relativity, quantum mechanics and systems theory. Out of this experience comes the sense of ‘oneness’ which inspires artists, poets, and the bliss described by mystics. It is intensely pleasurable and gives rise to the fact that it is relationships that are the key to happiness and not material consumption. These comments are brief, sketchy and something of a gross over- simplification and, hopefully will not be taken as more than casual remarks in response to your article. If you go back to Spinozas Ethics, you will find that he has said all this already and it actually makes sense. Also, I dare to claim that Acam Smith was misunderstood and misquoted due to people forgetting to understand the context in which he wrote. “The moral sentiments” has this all as well! GDP essentially is a materialistic development measure. It considers only material aspect of Human existence. As a human being we have other dimensions of existence as well like our intellect, our emotions, our psyche, our spirit/consciousness, our society, our nature. Real development is to evolve and progress on the health, intellectual, emotional, psychological, spiritual and social level and to expand our consciousness. Purpose is to find our unique gift and give it a way through creative expressions, to make this whole existence thriving. Materialistic well being is just a tool to achieve this. GDP growth model makes materialistic well being sole purpose of human life. It aspires us towards unlimited maximization of material consumption and possessions & take us in opposite direction of real development. Very nice article, thank you. I find the “less is more” ideology applied to any field of our lives including economy very powerful. Actually for many, in so called “developed countries” and even more in all other countries, “less is more” is not a choice but an obligation out of circumstances. The problem is that when people get less, they tend to crave for more and think that if they get more they will be happier. So the problem ultimately is in people’s consciousness and approach to life. The work would be to promote “less is more” philosophy with mindfulness approach for both the ones who have a lot and those who have less, while reestablishing some kind of social justice and equality between countries and people. There still are too many who don’t have the minimum in order to live…I really hope there will be more and more projects of an alternative economy based on human values, so that the change can arise both on an individual and a collective level. Great article, Dan. Thanks a lot. I agree, the utility function needs to be redefined. I would like to add that this “less is more” has also important implications for the economic growth theory. Plus, growth theory needs to take explicitly into consideration the ageing and shrinking population. These innovations in economic theory would then have very important implications for economic policy too. One component of a “less is more” economics would have to be what the philosophy means for corporations, including of course banks.There are two sides to this: how a corporation responds to a market of “less is more” proponents, and how the corporation itself practices the “less is more” philosophy.